I get asked this question a lot, and I have two answers for you. First of all, the clinical one. If your child’s six months or older, gaining weight as expected, and your doctor says you’re okay to end night time feeds, then go ahead and give it a shot. But that doesn’t really answer your question, does it? Because that information is readily available on about a thousand different websites. If that was all you needed to know, you’d know it already. Because if you’d pulled his night feeds and he just accepted it and started sleeping through the night, you wouldn’t be online looking for information about it. You’d either be in bed, enjoying eight hours of blissful, uninterrupted sleep, or you’d be at the playground, telling all the other moms how easily your little guy gave up night feeds, and how this whole parenting thing is such a breeze! So, let’s discuss the real question. 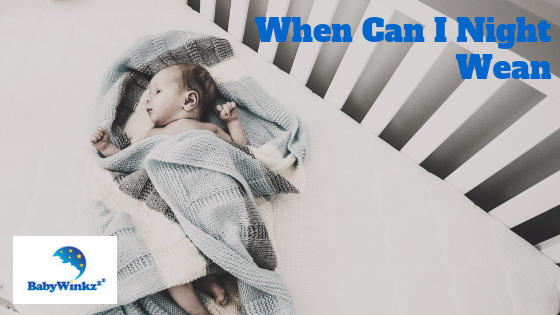 Why does your baby continue to wake up at night and demand food if they’re supposedly ready to give up night time feeds? The reason is actually probably pretty simple. That’s how they get themselves to sleep. Feeding and/or nursing to sleep is just about the biggest sleep prop I see as a sleep consultant. People don’t usually think of it as a “sleep prop” because of how natural and necessary it is. They tend to associate the term with pacifiers, mobiles and crib aquariums. But a sleep prop is really anything external that your baby relies on in order to get to sleep. So if you’re still feeding your baby to sleep at bedtime, chances are, that’s where you need to make some changes. Although it’s a less common scenario, I do see this fairly often. Mom is doing everything right at bedtime but is still feeding baby to sleep when they wake up in the night. Some babies are just habitual night time eaters. It’s not that they’re hungry, or in need of calories. They’ve just managed to disassociate bedtime sleep with waking in the night, and if Mom’s still willing to give up some breast milk in the night, well then, so much the better! The bad news is that you’re going to have to break this association by giving up night feeds. That’s going to mean some protesting, which won’t be fun for anyone. But the good news is that, since your baby’s learned to sleep without props at bedtime, that means he’s already got some strong sleep skills, and the protesting should be over within a couple of nights. So, what’s the strategy for this? The same as it is for quitting just about everything else. Cold turkey. Stop tonight and don’t start again. The sooner your little one learns those skills, the sooner he’ll be sleeping through the night. That’s great news for you and your partner, but it’s even better news for baby! More uninterrupted sleep means baby’s mind and body get more of those glorious restorative effects that take place during the night, making for a happier, healthier tomorrow! Preventing Overtiredness Should I Help if Baby Looks Uncomfortable?